PR News’ PR People Finalists and Rising PR Stars 30 & Under Honorees Announced; Communicators Will Gather to Celebrate Their Successes on December 4 in D.C. Hundreds of communicators will gather together for the unveiling of the winners who represent those teams that have set industry benchmarks for excellence across all areas of PR. 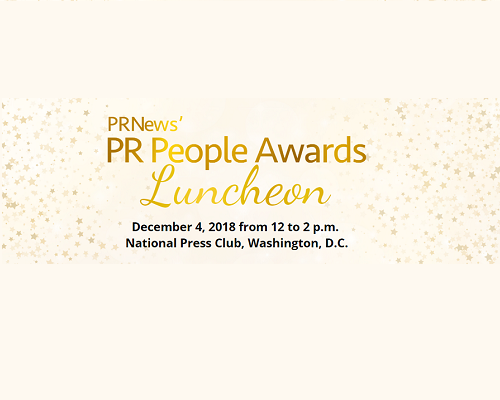 PR News will highlight the achievements of the 2018 PR People finalists and Rising PR Stars 30 & Under honorees at the PR People Awards Luncheon on December 4 at the National Press Club in Washington, D.C. Top talent will be showcased as well as all of the passionate professionals and budding PR leaders who day in and day out are making communications matter in the marketplace. View complete list of Rising PR Stars here.